law enforcement | Live Healthy S.C.
Saturday, April 28, is National Prescription Drug Take Back Day , which aims to provide a safe, convenient, and responsible means of disposing of prescription drugs, while also educating the general public about the potential for abuse and medications. A number of agencies, pharmacies, organizations and others across South Carolina are joining the Drug Enforcement Administration (DEA) to give the public its 15th opportunity since 2010 to prevent pill abuse and theft by ridding their homes of potentially dangerous expired, unused, and unwanted prescription drugs. The national observance is held twice a year. Find a location near you by visiting the DEA Diversion website and bring your pills for disposal. You can drop off unused prescription drugs at between 10 a.m. and 2 p.m. Saturday. (The DEA cannot accept liquids or needles or sharps, only pills or patches.) The service is free and anonymous, no questions asked. Last October, Americans set a record when they turned in a little more than 456 tons (over 912,000 pounds) of prescription drugs at more than 5,300 sites operated by the DEA and more than 4,200 of its state and local law enforcement partners. Overall, in its 14 previous Take Back events, DEA and its partners have taken in over 9 million pounds—more than 4,500 tons—of prescription drugs. For more information about the disposal of prescription drugs or about the April 28 Take Back Day event, go to the DEA Diversion website. This entry was posted in Prevention, Public Health and tagged abuse, collection sites, DEA, dispose, Drug Enforcement Administration, drugs, law enforcement, medication, National Prescription Take Back Day, overdose, pills, poisonings, pouches on April 25, 2018 by SC DHEC. 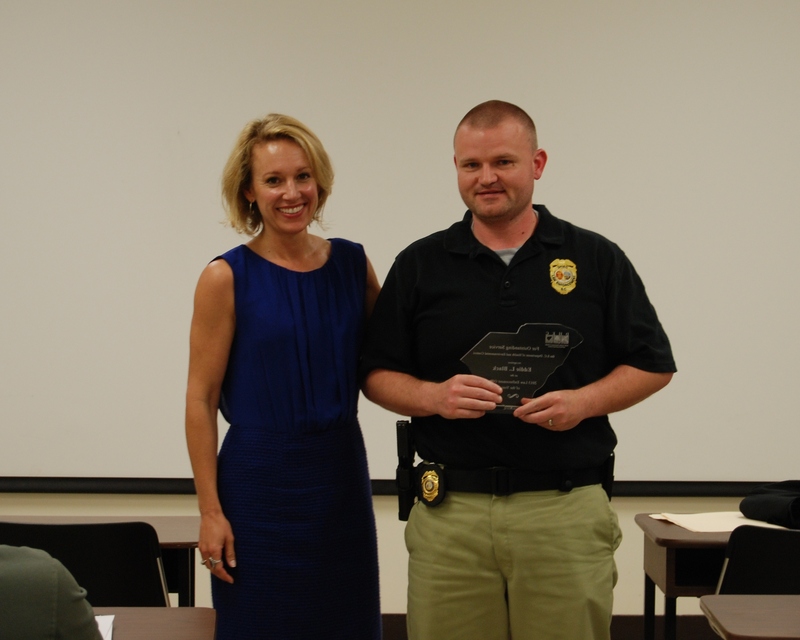 Congratulations to Officer Dennis Sechler of the Shellfish Sanitation Program for being named DHEC’s 2015 Law Enforcement Officer of the Year. 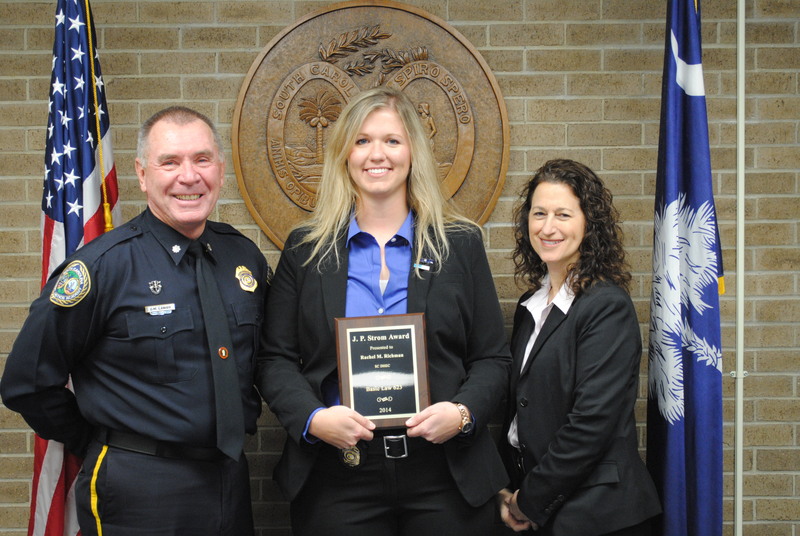 Officer Sechler, who works in the Myrtle Beach Office in the Pee Dee Environmental Quality Control Region, accepted the award on Thursday from Director Catherine Heigel. A member of the Regional Emergency Response Team and the field training officer for the Shellfish Program, Officer Sechler exemplifies our agency’s core values of promoting teamwork and embracing service. He assisted in developing the Shellfish Law Enforcement Training Curriculum for new Shellfish Law Enforcement Officers that complete the S.C. Criminal Justice Academy. This includes both classroom and hands-on training for new officers. The primary goal of our shellfish program is to ensure that shellfish and the areas from which they are harvested meet the health and environmental quality standards provided by federal guidelines and state regulations. The patrol activities conducted by our Shellfish Officers play an important role in helping the program meet its goals. These patrols are conducted on foot, by boat and on land vehicles. In addition to his regular duties and conducting weekend, holiday and night-time patrols, Officer Sechler has assisted the S.C. Department of Natural Resources with fish and wildlife cases and the Coast Guard with removal of sunken vessels from waterways and marinas to ensure no pollution is released to harm the environment or public health. Congratulations and thank you for your service, Officer Sechler! This entry was posted in Employee Recognition, Uncategorized and tagged awards, Dennis Sechler, DHEC, law enforcement, shellfish on May 19, 2016 by SC DHEC. 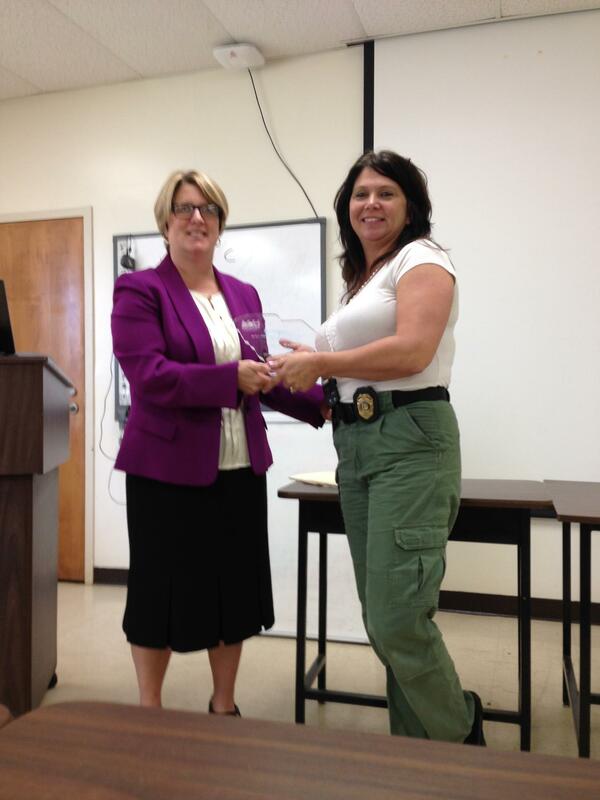 Angela Wallace has been named the DHEC 2014 Law Enforcement Officer of the Year. She has worked in the Bureau of Drug Control since 2002, and has recently been assigned to the Prescription Drug Monitoring Program as the law enforcement investigator/educator. Angie has been instrumental in educating both new and seasoned inspectors on how to approach drug diversion cases. I’m proud to say that she’s also been involved in complex investigations in conjunction with the Drug Enforcement Administration (DEA), and her efforts have resulted in numerous arrests and convictions. Angie always goes the extra mile and makes herself available as an expert in both proper pharmacy practices and current trends in pharmaceutical trafficking. Her familiarity with drug trafficking trends has proven to be extremely valuable in identifying organized pharmaceutical drug diversion operations. Congrats to Angie on this special achievement! DHEC is fortunate to have such talent within our agency. To learn more about DHEC’s Bureau of Drug Control, including prescription monitoring and site inspections, please visit our website. This entry was posted in Uncategorized and tagged Award, drug control, law enforcement on June 5, 2015 by SC DHEC. Many people don’t know that our Bureau of Drug Control (BDC) serves not only a regulatory role, but also provides enforcement of South Carolina’s Controlled Substances Act. In fact, our BDC inspectors are actually pharmacists who have undergone additional training and become state law enforcement officers. Our BDC inspectors conduct onsite inspections and audits of pharmacies, hospitals, and practitioners to make sure they are properly recording, storing, and handling controlled substances. These important members of our Public Health team make recommendations and offer assistance to help these entities follow proper procedures in handling controlled substances. They respond to complaints and concerns reported to DHEC that sometimes indicate criminal activity or misuse of controlled substances. When warranted, our BDC inspectors also make arrests. We are proud to introduce the two newest members of our BDC law enforcement team, Inspector Megan Bates and Inspector Rachel McCoy Richman. Both Bates and Richman recently graduated from the S.C. Criminal Justice Academy, where they took part in an intensive twelve week long course to become certified Class 1 Law Enforcement Officers. During the graduation ceremony, Richman received the academy’s J.P. Storm Award for her outstanding academic achievements. The award is presented to the member of the graduating class with the highest cumulative academic average. She is the 4th member of the BDC to be a recipient of this honor. Congratulations to Megan and Rachel, and thank you to all of our BDC inspectors for the work that you do every day to protect South Carolinians from potential abuse of controlled substances. This entry was posted in Health Regulation and tagged controlled substances, drug control, law enforcement, pharmacist on November 25, 2014 by SC DHEC. This entry was posted in Health Regulation, Outreach, Prevention and tagged controlled substances, drug control, law enforcement on May 23, 2014 by SC DHEC.